Linear, dsDNA genome of 130-150kb. The linear genome is flanked by inverted terminal repeat (ITR) sequences which are covalently-closed at their extremities. ETYMOLOGY Para: from Greek, “by side of”. Pox from English pock, ‘pustule’, referring to skin lesions. 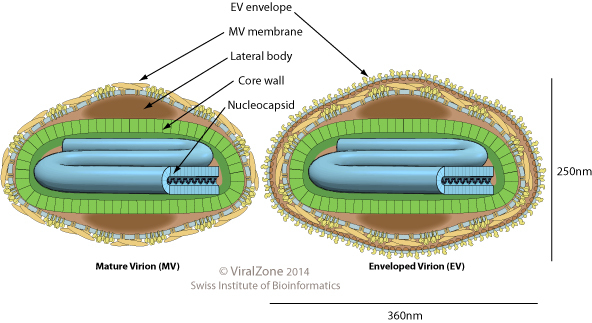 The orf virus encodes a viral bcl-2 protein (v-Bcl2) that prevents host apoptosis . Orf virus ORFV121 physically interacts with NF-kappaB-p65 in the cell cytoplasm and thereby inhibits host NF-kappaB signaling pathway . The poxvirus anaphase promoting complex regulator (PACR) promotes viral replication by manipulating the anaphase promoting complex/cyclosome (APC/C), thus promoting the host differentiated G0 cells to enter G1 .